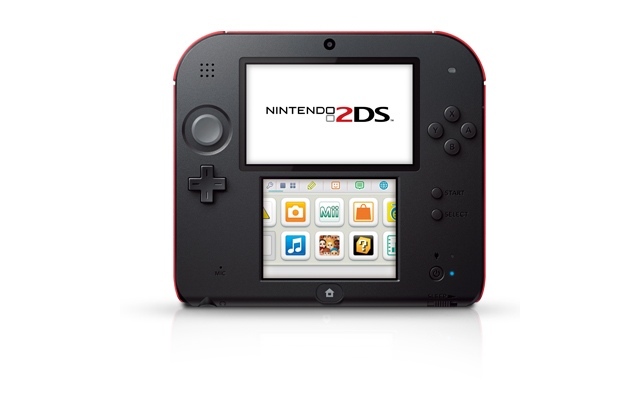 Nintendo have just revealed the Nintendo 2DS. Yes, a 2DS! No, your calendar app is not broken, and some random hooligan did not break into your house and change all your calendars from April 1 to August 28. It is functionally a 3DS, only without a stereoscopic display. It will play all 3DS games in 2D and be compatible with “more than 2,000” Nintendo DS titles. It can Streetpass. It can connect to the eShop. It can play games and apps downloaded from the eShop. It will even be able to take 3D pictures! You just won’t be able to see the picture in 3D until you move it onto a device that displays 3D pictures. The only other major difference between the 3DS and the 2DS is the form factor. The 2DS does not fold in the middle. The last time Nintendo used a non-clamshell design for their handheld was in 2005 for the Game Boy Micro. The system will be priced at $129.99 (USD) in North America, £109.99 in the UK, $149.95 (AUD) in Australia and $179.95 (NZD) in New Zealand. It will be released October 12th, 2013, worldwide. Next Post:OPINION: How About Console Support Instead of Company Hatred?